The Tenth Annual C. S. Lewis Festival Board of Directors invites writers to submit an original, never produced play (10 minutes) for the 1st Annual Scriptwriting Contest. 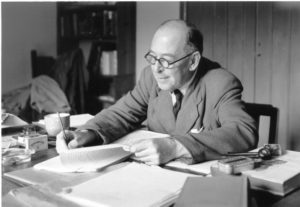 The award-winning C. S. Lewis Festival is inviting writers to base their work on Lewis’s writings or his life. The theme for the 2012 Festival is Lewis in the Public Square. It will examine the ways in which Lewis’s writings have influenced journalism, religion, music, theatre, and poetry. The Lewis Festival Script Writing Contest will culminate at Crooked Tree Arts Center on Friday, November 16 in an evening of the reading of the winning scripts and also commentary by Mark St. Germain, Freud’s Last Session playwright. Play should have 2 – 4 characters and minimal props and costumes. Must be connected in some way to C.S. Lewis’s life or work. Optional cover letter may be submitted. The second page should contain a cast of characters and time and place information. The third page will be the first page of the script. The other pages of the play follow. Name of the play and page numbers should be on every page. Five finalists will have their work read at the C. S. Lewis Festival event on November 16, and all finalists will have a chance to meet with New York playwright Mark St. Germain, author of Freud’s Last Session. Please submit the form below with your entry.